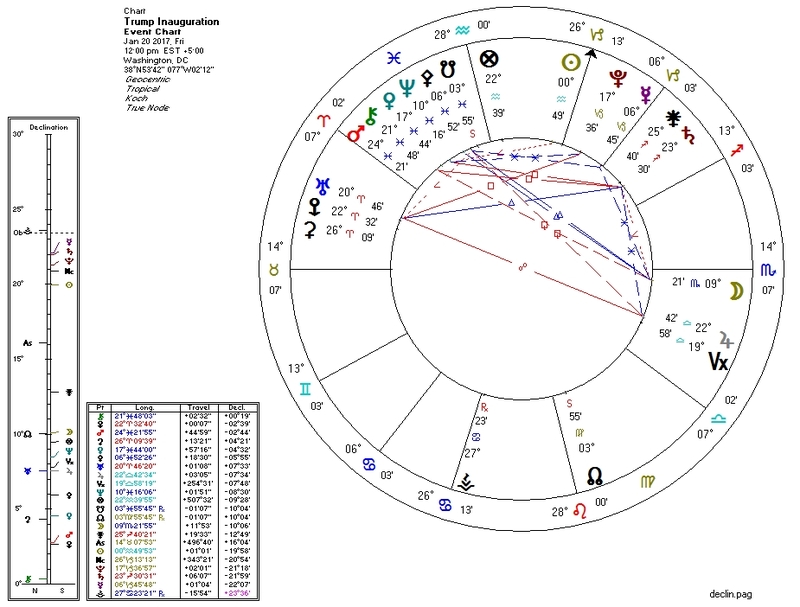 The horoscope for the inauguration of a new regime is not only the chart for a grand public ceremony, but also the chart for the regime itself. Accordingly, we examine today the horoscope for the inauguration of "God Emperor" Donald Trump. Apollonian: Pallas sextile Mercury, decile Sun, and ruled by Jupiter (which is square Sun and semisquare Mercury) and Neptune (which is novile Sun and sextile Mercury). Dionysian: Pallas conjunct South Node. Apollo may be about as strong as Dionysos here. On "The Axis of Good and Evil" this probably puts the event in the "Statist" quadrant. The Pallas conjunction to the South Node is a puzzling wildcard, however. On the surface, it suggests increasing authoritarianism, but (in a case recalling that of Leopold II) these two points are actually moving away from each other by secondary progression. This latter interpretation would tie in with the libertarian trend in the progressed US chart, and possibly with the conservative trend in the transits for the next few years. Capitalist: none here, though the "Apollonian" vectors above are also capitalist vectors. Collectivist: Venus conjunct Neptune; Second House ruler Mercury trine South Node. This is a strong Leftist signature economically -- it is countered at least in part by the Pallas vectors. Also, Neptune here is conjunct the South Node, possibly representing the reduction of collectivist factors? Liberal: Moon trine/contraparallel South Node and trine Neptune. 1. Pallas conjunct South Node. 4. Moon ruled by Pluto. 5. Sun ruled by Saturn which is parallel and by Uranus which is square Pluto. On top of all this uncertainty, the chart sports the recent Jupiter-Uranus-Pluto T-square, suggesting major public disruption. There's also the question of whether the inauguration chart actually represents the regime at all. After all, the election chart is strongly libertarian, and unlike recent US Presidents Trump has in many ways been "acting as President" since immediately after being elected.